Since supersized servings of collard greens weren’t doing the trick, I resorted to fudge sundaes during the daytime at work and Chunky Monkey ice cream at night. :). I still didn’t gain weight but continued on with my love for the fatty delectable dessert. Until recently, when I saw my old treat in the freezer, I had forgotten all about it. I was curious about the nutritional label and had to sneak a peek at the label. Back then, I don’t think I noticed food labels. My girl Oprah says it best. “When you know better, you do better.” She’s right. Twenty-nine years later, I finally read the jaw-dropping label. Hoooooly Moly!! 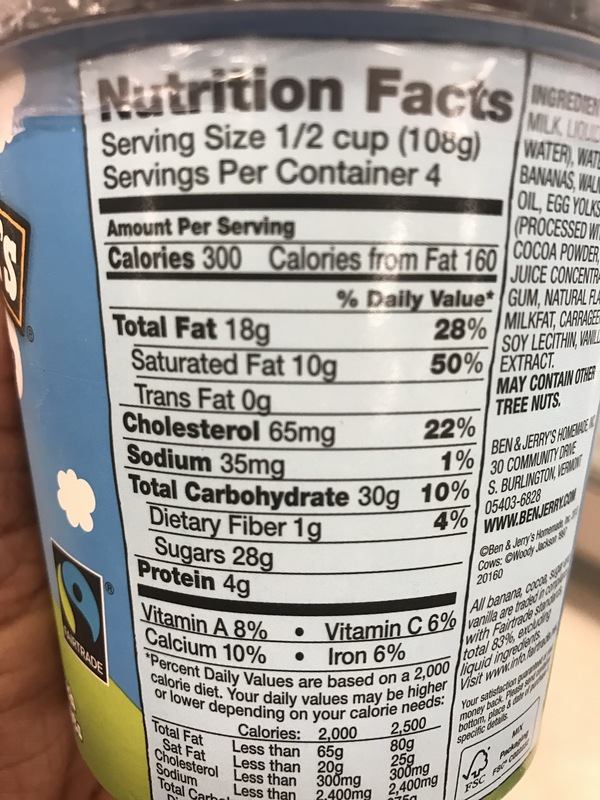 28 grams of sugar X 4 servings is 112 grams of sugar!!!! 300 calories per servings X 4 servings = 1,200 calories!! 300 grams of fat per servings X 4 servings – 112 grams of fat!!! I’m dying thinking about this… mouth wide open…. thinking about how many times I ate a full pint and what the contents were doing to my body. It makes me wanna barf. Ugh! Looking at me then, I appeared to be the epitome of health, and for the most part, I was healthy, or so I think. However, my metabolism was high, my body processed the food quickly and at almost 5’9, I weighed 125-130 pounds. Surely had I continued to eat Chunky Money at this pace with a few other bad food habits, I was on my way to being overweight and dealing with health issues such as high blood pressure, heart disease and more. Back then, even though I overindulged in sugary treats like this, I also balanced out my diet with daily servings of fruits and vegetables. A high metabolism and good genetics kept me slim and trim, and I did not have any health issues. But the fact is, my diet exceeded the daily recommendation for… well. Everything. Today I thank God for putting me on a path to a better place where I learned to make smarter choices about my health and well-being. Too frequently though many people wait until a medical condition dictates a lifestyle change. Particularly women. Women of color. Heart disease (22.3%) and cancer (21.6%) remained at the top of the list for ALL females, ALL ages. When you consider the fact that lifestyle behaviors can significantly reduce women’s risk factors for these illnesses it is disturbing. If you have prediabetes, research shows that losing 5%-7% of your body weight and getting at least 150 minutes each week of physical activity like brisk walking can prevent or delay type 2 diabetes. Why do women wait until a doctor tells them that a lifestyle change is in order? If we learn to listen to our body, it usually sends signals by responding to the food we eat, the beverages we drink, and other behaviors. If you walk up a flight of stairs and you are out of breath, that means something. When was the last time you had an annual check up? Take a pledge to live a healthier lifestyle. Even better, commit to a better lifestyle with a family member, a friend, or a colleague. Try a new recipe, join or start a walking club, take a yoga class, take a strength training class, or something else, just get busy moving. Please! 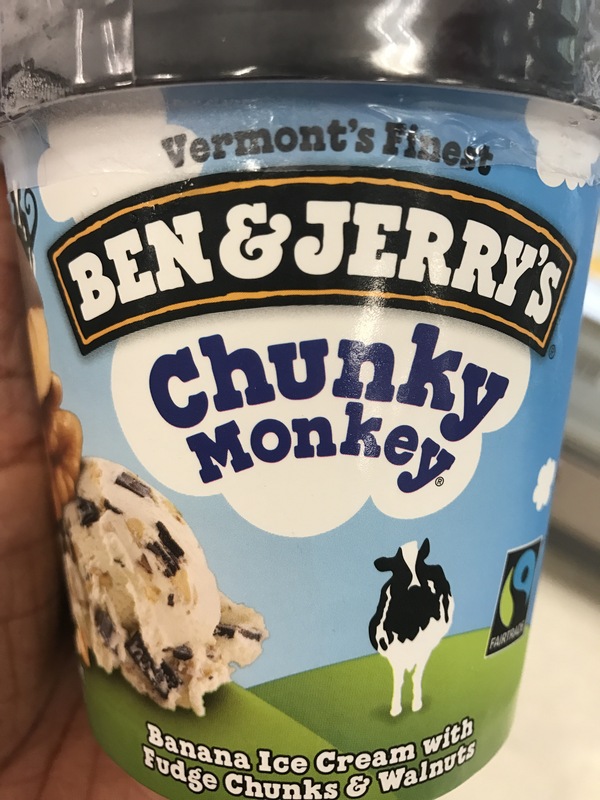 Oh and… if you’re gonna get down with Ben & Jerry’s, remember portion control or better yet, try making your own healthy chocolate ice cream, Avocado Ice Cream or a quick frozen strawberry yogurt. Making your own is healthier and more fun. Making small changes in your life can net significant health benefits. Instead of attacking your health with major changes, start with minor changes like drinking more water and less juice or soda, reducing the amount of sugar you put in your coffee or substituting one high-fat food item with a lower fat food item. Take the stairs instead of escalators and elevators or do jumping jacks or pushups during commercials of your favorite TV show. Over time, you will experience big gains. Whatever you do, don’t give up on yourself because I won’t give up on you. Grad school is slowing my posts, but I’m still here. This entry was posted in Family Living, Fitness, Healthy Living, Inspiration and tagged behavior, black women, cancer, diseases, food inspiration, heart disease, inspiration, lifestyle, stroke, wellness, women's health. Bookmark the permalink. Hi Shawn! Both can be good! Lol! !